Flying & obtaining meals can be hard when you are vegan. Most airlines to and from the UK do not offer vegan inflight meal options on short haul at all (payable, nor free). 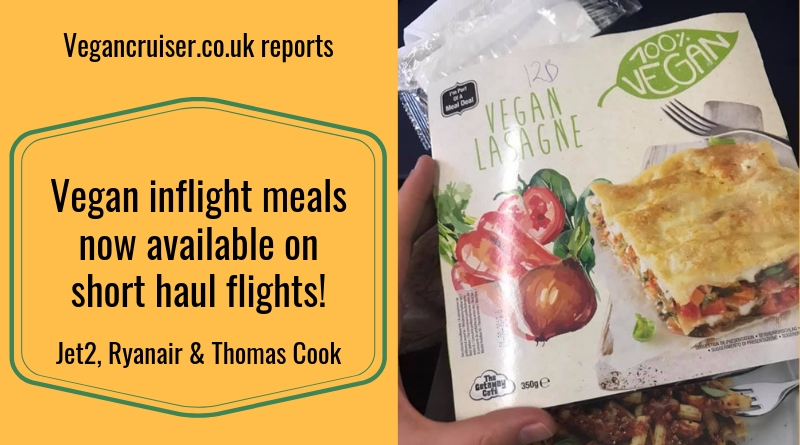 Long-haul provision of vegan airline meals is much better, though even then the vegetarian vegan meal (VGML) can sometimes go missing or at times they contain lacto-ovo vegetarian meal (VLML) items on trays. 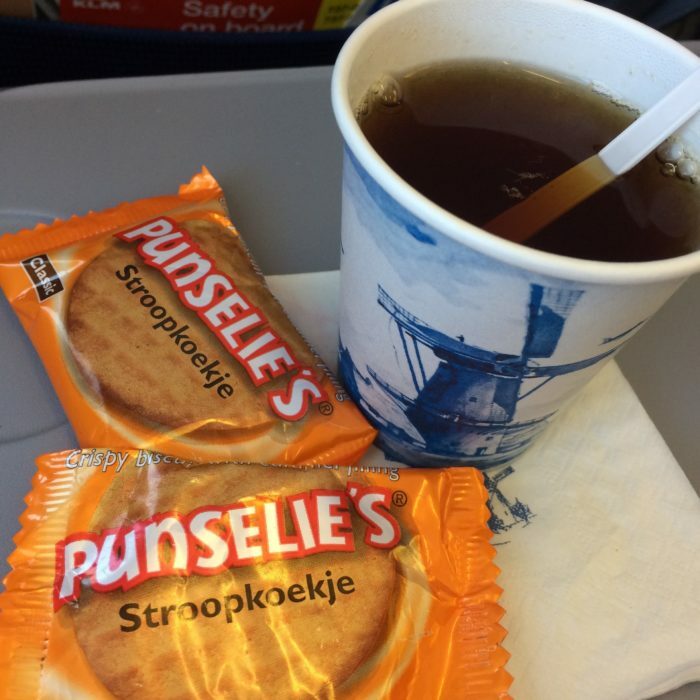 On short haul flights within Europe, I have always had to carry on my own food onboard. That has suddenly changed as three airlines have stepped up their game. Our vegan airline food heroes for 2019 short haul holidays are Jet2, Ryanair and Thomas Cook! Are you as surprised as me? 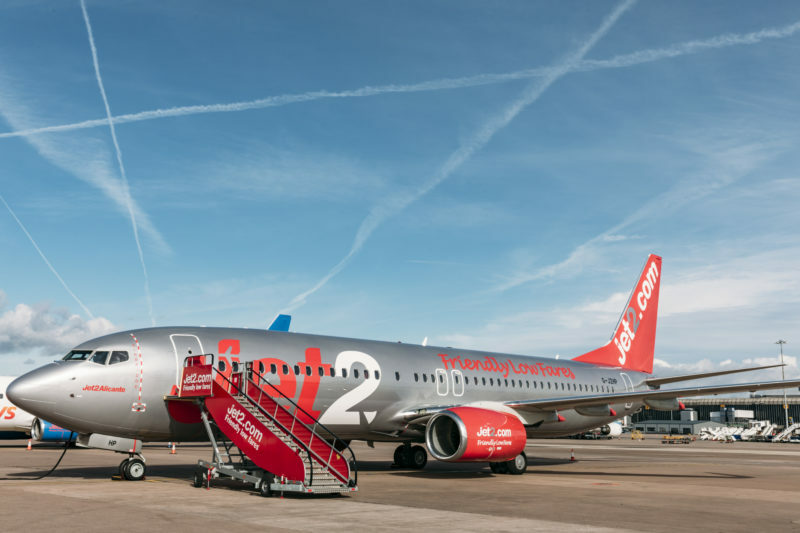 At the start of 2019, Jet2 marked the end of Veganuary with a press release about their vegan inflight meal offering. This saw the addition of a vegan pasta Arrabiata dish to their extensive menu selection for 2019. Unfortunately, the is not visible on the brand’s website anywhere apart from the Jet2 PR pages. Considering the promotion this Arrabiata dish has had in the press, it must be possible to add one once you have an actual flight booking with the airline. 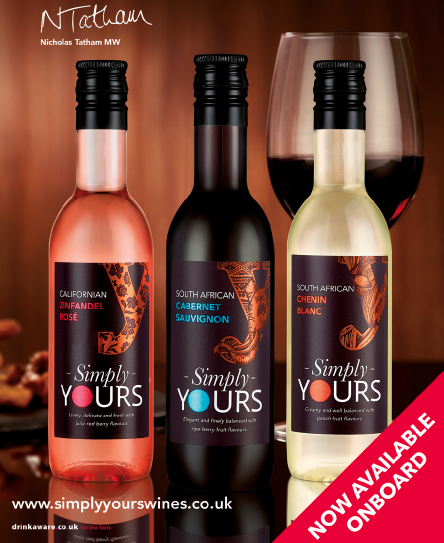 The old menu available on Jet2 website (v2 2018) features three wines available onboard, by a wine brand Simply Yours. I contacted the distributor in the UK and found the following info. The South African red featured on the Jet2 menu online is discontinued (hence no info on its vegan status). 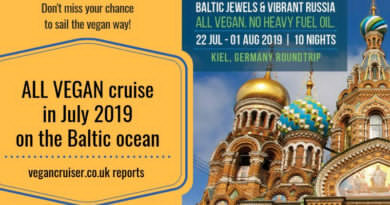 The white wine featured on the Jet2 menu, a South African Chenin Blanc, is vegan, If Jet2 have replaced the old discontinued South African Cabernet with an Aussie Shiraz or Chilean Merlot, both of these red Simply Yours wines are vegan also. The rose Zinfandel, unfortunately, isn’t. So you should be able to have a vegan glass of wine with your pasta dish… the Chenin is a guaranteed vegan option. 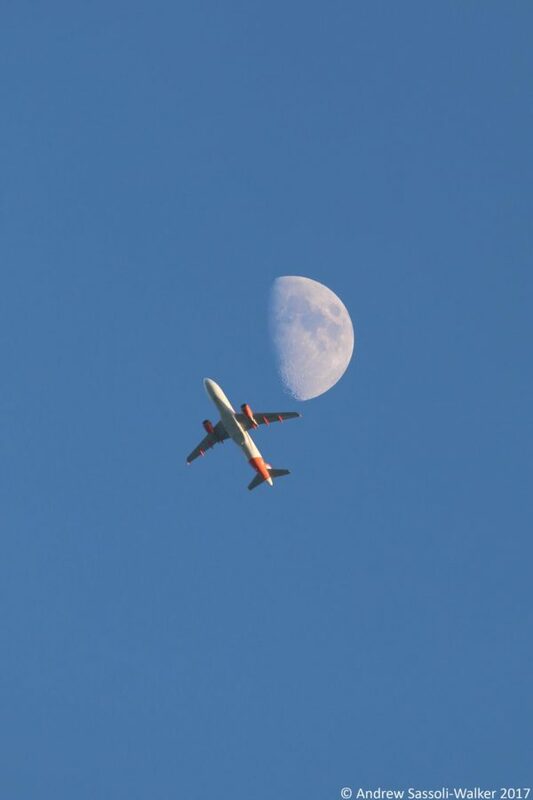 If you fly Jet2, please do share pictures of the dish with us! 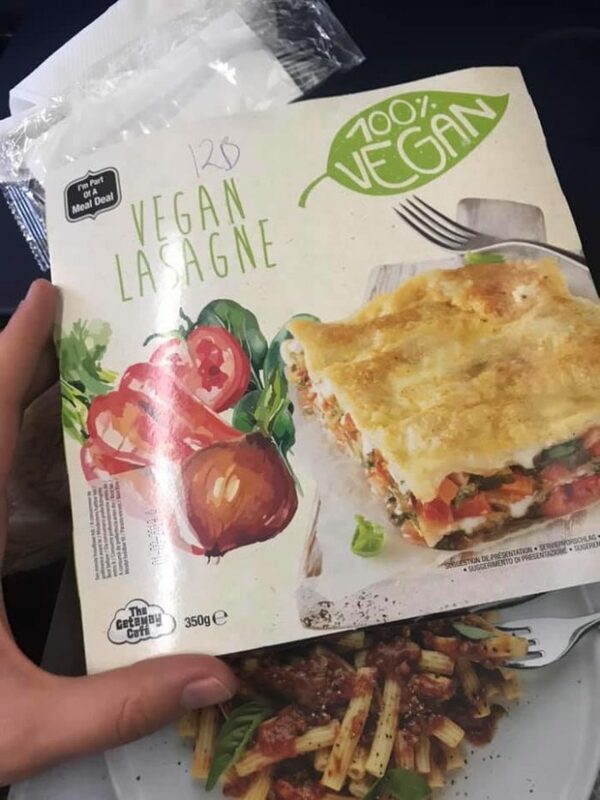 Ryanair vegan inflight meal: a total surprise! On April 2nd, 2019, Ryanair gave us the biggest surprise of all. Not just a vegan inflight meal, but an actual vegan menu feature in their inflight magazine. 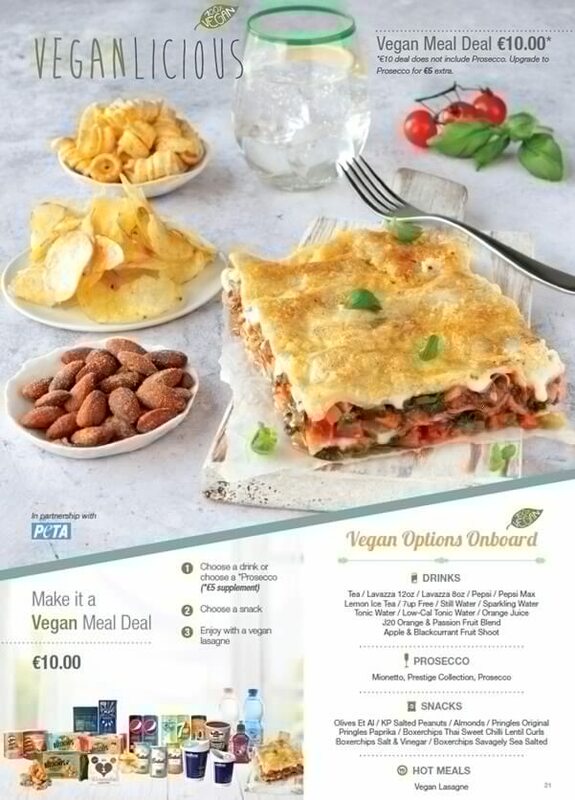 This meal-deal menu they created in co-operation with PETA UK. We may all have different opinions of PETA but personally, I find it so exciting that an airline would pair up with an animal rights body to ensure an actual vegan menu was available to their customers. 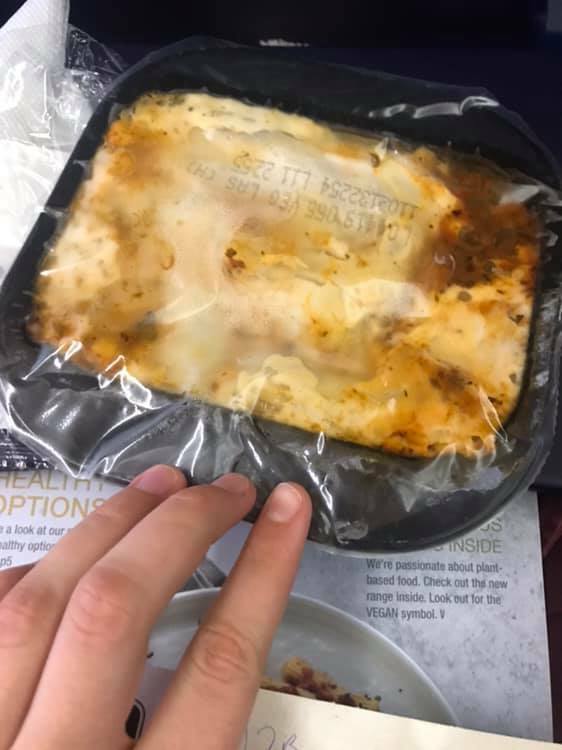 Here are some photos from a fellow vegan traveller – of the exciting vegan lasagna dish Ryanair have on their menu. I know! Not another tomato pasta or a falafel wrap – an actual vegan lasagna with cheese! My jaw fell to the floor when I saw this. And it is reportedly very tasty too! Ryanair have also reduced their use of palm oil on the onboard menu from 33 to 19%. They further pledge to reduce it by another 4% by winter 2019. Not that palm oil is a vegan dietary issue but related matter due to ethics for many of us. 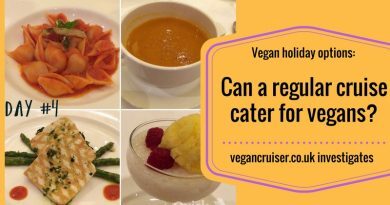 Thomas Cook caters for vegans aplenty! 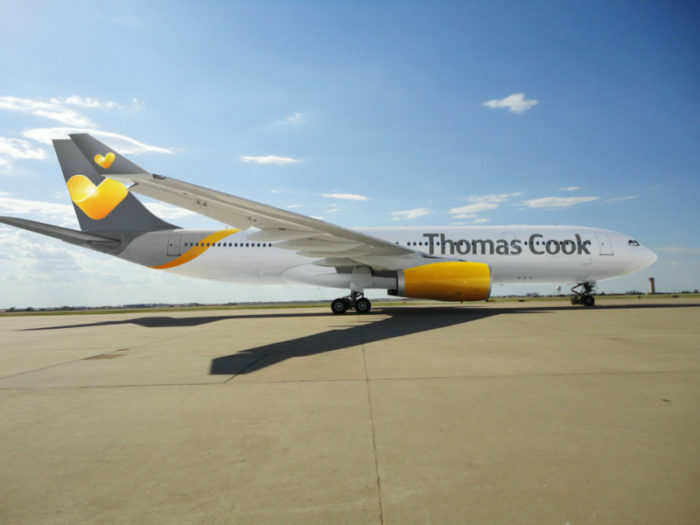 While TUI UK only offers chips as the vegan alternative on their flights (their pasta Arrabiata is marked suitable for vegetarians only) the other UK big-name package holiday provider & airline Thomas Cook has vegans options. These are bookable on all trips, be they short-, mid- or long-haul flights. This would certainly help me choose a Thomas Cook holiday over others operating on the same route & destination. Just look at what they can offer below, for a short-haul flight! Even at breakfast, Thomas Cook have a separate vegan inflight meal option to offer. Plus their inflight vegan options include separate dishes for in- and outbound flights, not just one same daytime vegan meal option! But don’t other airlines cater for vegans too? Unfortunately, they really don’t. Not on short-haul routes to and from Europe. Our national UK airline has two vegetarian cheesy M&S sandwiches to buy. Despite people like myself asking for over a year to have one of them changed to a vegan option, they still only offer nuts and crips as the ‘vegan choice’. 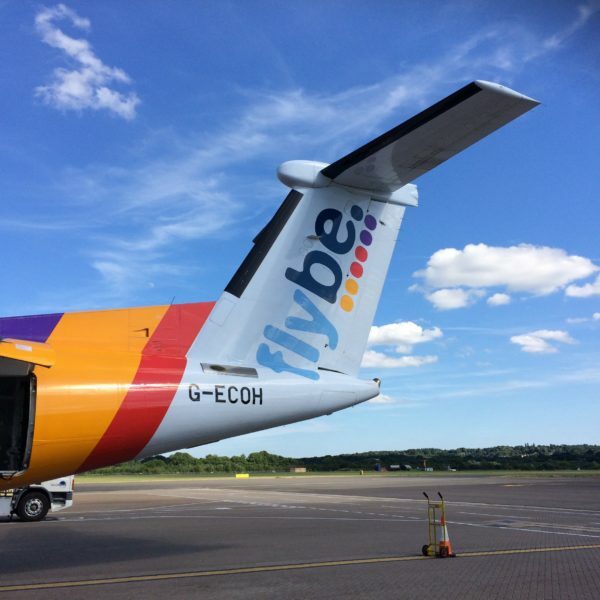 It is the same with the small purple plane UK operator, who doesn’t even label vegan options. There always is a mini tub of Pringles to devour if you’re super hungry and haven’t managed to buy food at the airport. Thankfully the majority of their flights are very short and domestic, certainly from Scotland. The Dutch equivalent of a national airline serving UK holidaymakers (via Amsterdam) frequently offers guests onboard a hummus & falafel wrap. Sounds exciting until you realise it has both egg and a yoghurt dressing in it. It could SO easily be made vegan! Yet the only thing you can eat (for free) on their flights are the little Punselie cookies, nuts and the vegan Elements wine from South Africa. The only place you can find soya milk is their airline lounge at Amsterdam – see what vegan options you may find in there on this separate blog post of mine. Easyjet does much better, though not as well as the three airlines featured above. The inflight catering menu on Easyjet flights has either a middle eastern mezze platter (olives, pepper dip, hummus, crackers and piece of baklava) or a hummus & falafel wrap to choose from. Still considerably better than the many other popular airlines out there. 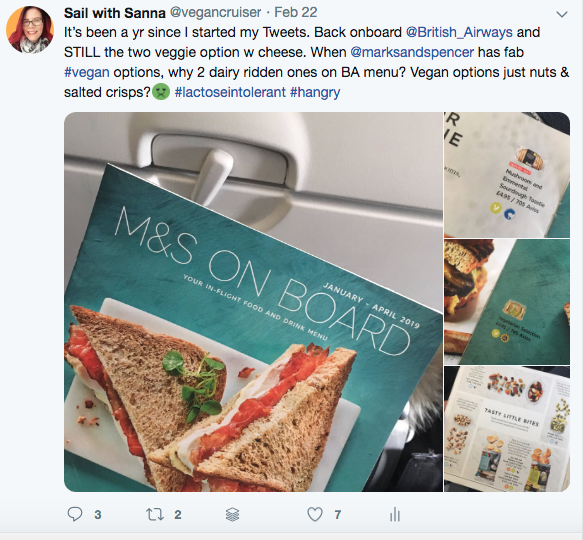 When the UK high street (restaurants, pub chains etc) and supermarkets are exceedingly vegan-friendly, it is surprising that only the budget airlines like Jet2, Ryanair and Thomas Cook are responding to vegan demand. How refreshing to have a range of inflight vegan options for short-haul travel from the UK and not having to always carry your own food on you! Any horror stories or praise to share, regarding inflight vegan meals you have had on your travels? Please do share!